Dr Adam O'Brien and Claire Lissaman are the authors of a new study looking at the diagnostic characteristics of lung US for Paediatric pneumonia. In this interview we talk about the study and how to scan kids with chest disease. The latest instalment of the RADU / Broomedocs podcast. How much insulin is sweet? Parachutes: are they really worth the extra luggage fees? This is a story that I told at the DFTB18 storytelling event. The theme was about kindness, justice and hope. It is a personal, non-clinical story that I hope can help others out there. This month we cover a lot of fluids - saline, balance, FFP as well as some penile fractures and Justin explain why he is a great driver. This month we cover bougies, brain-bleeds and the best Paeds DKA paper ever. We also degenerate into the recent and remote evolutionary history of hiccoughs... fun times are to be had! A new project - a Rural Anaesthesia Journal Club. Bringing the gas data to the bush. This episode I reflect upon a really tough airway case. I have asked a number of airway gurus from the FOAMed community to comment on the logistics and plan to manage this case. Welcome back to the Journal Club with Dr Justin Morgenstern. It has been 2 months since we last dusted off the papers on Justin's bedside table... but like a mythical (nerdy) Sisyphus Justin must push another load of evidence out into the ether in order to go back and start the whole process again. This episode is on steroids. I mean it is largely about steroids, not actually "on steroids" but there is a sprinkling of other stuff and a bit of philosophical banter about machine learning at the end. So sit back, grab a beverage and tune in for another hour of evidence and education from our corners of the world. The new podcast series is all about CLINICAL REASONING. Exploring how we think through a diagnosis or problem. In order to do this I have teamed up with Dr Rob Park, a Queensland GP from the "Sunny Coast"
The latest episode of the journal club features an ecclectic bunch of papers of variable quality presented by two minds of variable quality!! We cover alcohol levels, ear tubes, eyelid injuries and HUGS! A ripper of a journal club episode. Recorded live in Berlin at the DasSMACC conference last week. Justin and I invited a cast of superstars to share a drink over the mike and discuss an eccectic bunch of papers. In this podcast she shares a tragic story that changed the lives of a number of people. The first Journal club episode for 2017 with Dr Justin Morgenstern. Welcome back the the last journal club with Dr Justin Morgenstern for 2016. [Yes, it is now 2017... but that's life.] Another batch of 10 delicious articles to satisfy your post-Christmas cravings for academic nerdiness. There a bit of something for every taste this month. At the last SMACC outing in Dublin there was a stand-out lecture by Dr Ross Fisher ( @ffoliet ) entitled: Things that Scare Me. Ross is a bit of a presentation guru - and hence he had plenty of pressure on to deliver a great talk.... and he did exactly that. It was a pin-drop-silently, slideless baring of the soul. This is the back story behind the talk that lead Ross to learn a lot about himself and how doctors sometimes behave towards one another. This episode of Lessons Hard Learned comes from Johannesburg in South Africa - I am joined by Dr Tori Stephen to discuss a tough trauma case and some pearls from trauma on ultrasound and clinical decision-making in traumatic crises!. November's edition of the Justin and Casey Journal Club is out! Another month of interesting reading with Dr Justin Morgenstern. Check out the First10EM blog for full written version. Another month of interesting reading - articles of the month journal club with Dr Justin Morgenstern. Its a new month and that means a new episode of the First10EM / Broomedocs Journal club. So sit back, grab a beverage and listen in for the JC with J&C. This episode of "Lessons" is a little different. My guest is Dr Heidi James, Canadian Primary care doc, and one of the voices of the Primary Care RAP podcast. Today's "Lesson" is all about knowing one's limitations, scope of practice and appreciating the little voice inside one's noggin. Dr Andy Buck is an ED Physician who works all over Australia, but is based in Melbourne where he runs the very excellent Emergency Trauma Management course. This is a case of procedural sedation which goes a little awry. It is a nice counterpoint to all of the stuff we hear about safety, "fasting status" and the classic - "easy intubation, rocky extubation" scenario. Another lesson Hard Learned episode. This week I am joined by Dr Anand Swaminathan from Bellevue Hospital in NYC. Anand shares a tricky case involving the treatment of a VIP patient in his ED. We discuss a few strategies to help keep both you and the patient safe when we are treating VIPs. Another month of rapid fire journal club with Dr Justin Morgenstern and myself. This Lessons Hard learned with Dr Seth Trueger in Chicago is all about how we deal with the 'frequent flyers' in our EDs. This group of patients present a myriad of cognitive and clinical challenges. So have a listen to this case and learn a few lessons, share your experiences too! We discuss 14 of the papers you ought to read from July 2016. This is a discussion of a tough airway case - my mate Dave Forster and I go over a tough case and he tells me the "how", some great tips and tricks and how to run a team in crisi scenario. This is a discussion on the use of early, peripheral vasopressors in patients with septic shock. - use it peripherally (ie. through a good, watched, flowing IVC - idealaly proxiaml to the elbow. - think about the use of CVCs and potential harms / benefits in small hospitals. This is a podcast that discusses the everyday application of Evidence based medicine into real-world scenarios. Shared decision making is a simple concept with a lot of dynamic factors to consider - how do we make it work on the floor or in the consult to ensure best outcomes for our patients? Dr Penny Wilson - regular guest on the podcast nad author of the "bits n Bumps" podcast has recorded this really interresting interview with my old boss, mentor and teacher - Dr Geoff Riley. Geoff has a practice as a GP and Psychiatrist which includes a large number of health care professionals. He shars his insights on how to be a doctor when your patient is also a doctor. After the recent NEJM paper on the US vs CT for suspected renal colic - I have asked Dr Adrian Goudie to share his thoughts on the modern workup for the patient with possible renal stones. This is an introduction to the basics of lung ultrasound. It focusses on the "how to" of setting up your machine, probe use and position as well as some pearls for young players. This is a chat I recorded with my mate and mentor Dr Jim McDonald. Jim is a 45 year veteran of GP, and has worked all over Australia in family, Aboriginal health, Anaesthesia and Obstetrics. He is based in Melbourne but spends his time doing locum work with us in Broome. In 2015 Jim was awarded the Order of Australia for his contributions to MEdicine. After the recent blog post on Strept throat and swabbing with a look at the sequelae of this common disease I have recored a chat with some gurus. A quick Brome Pearl rant on the perils of confusing the biostats we use when we describe the effects of screening. Use mortality (all cause) not 5 year survival. The use of Optic Nerve Shaeth Diameter measurement for assessment of patients with potentially raised ICP has been a contentious area of practice for a few years. The studies look good at first read, but then when you stand back and look at them all - something is wrong - they all disagree on the norms, the cut-offs and the anatomy. So I have enlisted the help of Dr LEanne Hartnett - US-wielding ED Physician from Fremantle Hospital in WA. Leanne helps us sort out the facts and form an idea of where we need to go to make this potentially beautiful use of US really work on the floor. This is the audio from a recent hangout chat about the common problems we face when trying to assess and manage small children with fever in the ED. Teething, UTIs,, otitis media, pneumonia and all the ways we can get it wrong are discussed. After the recent publication of the process trial in the NEJM and discussion all over the FOAM forums - I have been contemplating how we might apply the findings in our smaller EDs, in the small rural towns where patients still get sepsis, and I believe should get world's best care. PROCESS has many helpful findings that I think we can utilise... despite being a negative trial! A discussion about the practicality and logistics of dealing with trauma in the field, in a small ED and in transit. Another Irishman delivering a lesson in medicine. Andy tells us about a case that might have helped shape his future career! Recorded at BCC4 conference in Cairns. I caught up with the lads for a chat in the garden - apologies for all the birds and kids! It is that sorta conference, that sort of place! DR Justing Coleman - The NAked Doctor shares his thoughts on the modern trend to overdiagnosis and treatment in medicine. This is the final installment of the PE Prognostication series. In this episode we cover the prognosis of patients with PE - the PESI and simplified PESI scores and how they might be used in the diagnostic decision-making strategies for the "low-risk" PE patient in ED. This is part 1 of a 2 part PE podcast. In this one we cover the history of PE evidence and the current methods of assessing PE risk in the low-end of the PE spectrum of disease. Ok, are you confused about the title? This is a podcast where Dr Penny Wilson (GP-Obstetrician) asks all the questions she is dying to know about the dark art of Obstetric Anaesthesia. We cover some basics of tox assessment, common interventions and myths of toxicology. This is a quick case discussion that looks at the CICO - surgical airway stuff. Dr Tim shares a case from his early days. The LActate clearance debate with Dr Seth - its about haow we can use lactate to guide resus in sepsis. Another lesson for us all. I am joined by Matt Dawson to discuss mistakes and lessons we can learn when scanning in the ED. There is a lot of tips from the guru and a prelude to his upcoming stage show on Broadway with Lady Gaga. 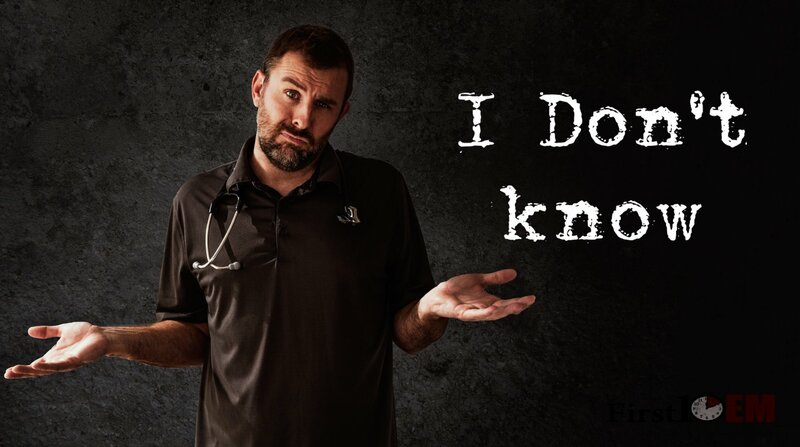 Dr Dave Forster shares a story about a consult that started out on a bad foot, but eventually resulted in a save, a great relationship and some really valuable lessons. A 30 minute discussion on what is new in the diagnostic / USS work up for women with 1st trimester bleeding. Dr MAtt Dawson of the US Podcast shares his pearls. Dr Tim L is a country GP - biut also a very naughty boy. We caught up fior a chat about Drug errors and he shared some experiences from his days as a JMO on the wards and the disaster that can occur. Infertility is a common problem in office GP and something that I do a lot of Anaesthetics in order to assist in the work up and therapy of these couples. Penny Wilson joins us again to discuss infertility. HEre is a 20 minute chat I recorded with Dr Geordan Shannon - she tells me how it is with Women's health including what is new in Pap smears, cervical cancer and a bit on Aboriginal health. I team up with Dr Wendy Hughes - local O&G specialist to discuss the manageemnt of a heavily bleeding woman in the late part of pregnancy. This is one of those presentations which can really stretch ones mental and physical resurces. So have a listen as I learn how to do it from the boss! This is the 8th episode of the "Lessons Hard Learned" series. In this podcast - I chat with Dr Rob Orman of ERCast fame. Rob has some great pearls to share with us on being a little bit more humble, human and happy in the ED. ITs still Paeds month here in Broome Docs. Mel spent a bit of time doing Aid work in South East Asia and has an interest in migrant Paediatrics, tropical disease and is now spending time in the Kimberley. This one involves a case from a PAeds ED. It is a perfect Swiss Cheese syndrome. 7 lessons I have picked from this one. Maybe you can see more? This is the first in my "Lessons Hard Learned" series. This is a sort of confessional, where we explore the lessons we can learn from patients, problems and our mistakes. This is a story told by Dr Tor Ercleve - Emergency Physician and cartoonist of the LITFL blog. Check out the poll and let me know what you would do. This is a quick grumble, a rant about the stuff junior staff sometimes say that really adds nothing to the care of patients and I find hard to listen to!